In March, 2013, Chen Xiaoxing came to Chicago to do a workshop on Xinjia Yilu. Nancy and I stayed for the weekend in a hotel downtown. After the first day of the workshop, we took a walk from the hotel onto Michigan Avenue. We wanted to do some shopping along the Magnificent Mile and enjoy dinner at the Cheesecake Factory. March in Chicago can be very cold, but we got lucky. This was the warmest day of the year in Chicago after a cold winter. The photo above shows Nancy as we are beginning our walk. 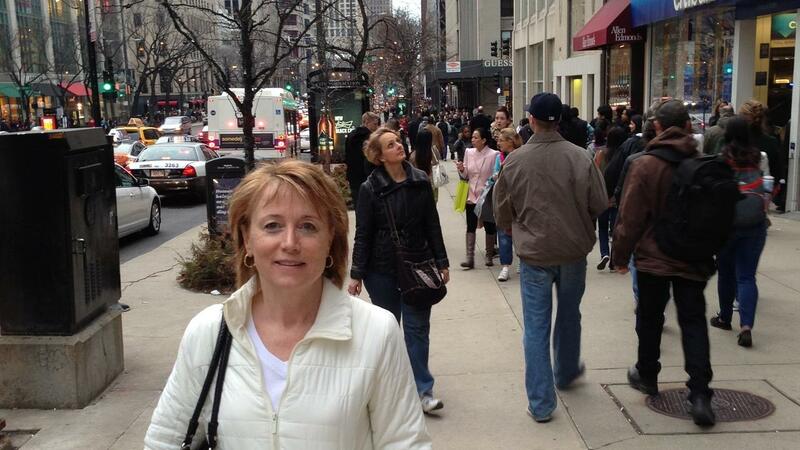 The Magnificent Mile is behind her down the street. As we got into the shopping area, the sidewalks became more crowded. I was enjoying the people but I noticed there were a lot of young people in their teens to around 20, maybe 21 or 22. We kept walking and there were more people. The young people were scattered through the crowd, in groups of two or more.